INeedCoffee offers two ways to connect your product or service to one of the largest coffee consumer-facing blogs on the internet: Sponsored Posts and Advertising. 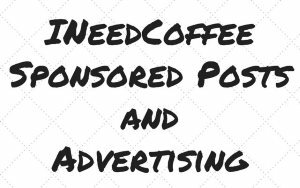 Sponsored articles on INeedCoffee are an affordable way to connect your product or service to one of the largest coffee consumer-facing blogs on the internet. It is not for resellers. Your post will be published directly on our homepage and reside in our archives among our regular articles. The post will also be shared on Twitter and appear in our Feedburner newsletter. We allow you to write sponsored articles. Articles can include images, embedded video clips, testimonials, and links to your product. Just keep in mind that your article must still provide value to our readers. We can work together on shaping your article. Why Publish a Sponsored Post With INeedCoffee? 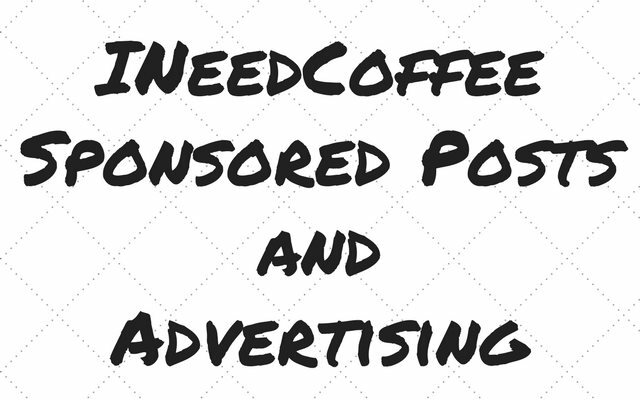 Here are a few reasons why you might consider sponsoring a post on INeedCoffee. High Traffic: INeedCoffee consistently delivers 110,000 –150,000 page views each month to coffee fans. More details below. 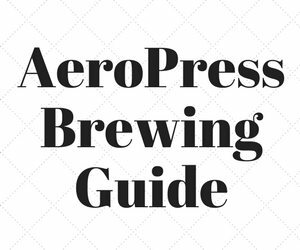 Content: Our focus is on helping coffee drinkers on their coffee journey. 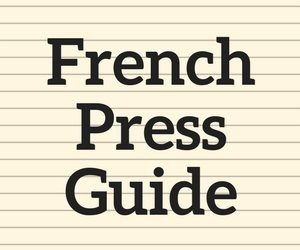 We have hundreds of articles and tutorials to assist them. Many of our readers visit our site to make purchasing decisions. Longevity: INeedCoffee has been online and actively publishing since April 1999 and we are just getting started. Speed: INeedCoffee loads faster than almost all coffee sites on the Internet. Not just in North America, but across the planet thanks to an optimized CDN (Content Delivery Network). Secure: INeedCoffee is fully secure (HTTPS) and being delivered via the faster HTTP/2 protocol. Responsive Design: INeedCoffee is mobile and tablet friendly. You’d be surprised how many coffee sites still aren’t. Not an Industry Site: INeedCoffee is not an industry blog written for industry people. INeedCoffee is for the fans of coffee on their coffee journey. No Annoying Pop-Ups: We will never cover your content to display pop-ups to promote our newsletter or anything else. Each month, INeedCoffee averages around 140,000 page views while serving 100,000 users. Our user base mostly finds us via search (~90%) and changes daily. Our audience primarily comes from the United States (59%), Canada (8%), and the UK (7%). Mobile users make up for 55% of all traffic. 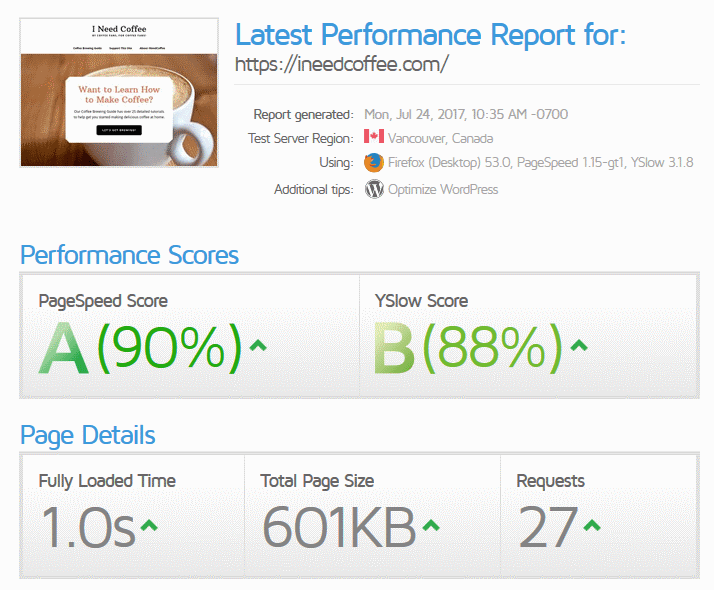 INeedCoffee strives to make our site as fast as possible for our readers. Don’t waste your brand awareness budget on sites with sluggish servers that take forever to load. Below are speed tests that were taken on July 24, 2017, from Pingdom and GTMetrix. If you need the article written for you, contact us and we can work out something. INeedCoffee has been online for almost 20 years. We are looking for partners looking to promote their brands and bring value to coffee consumers. Each new Sponsored Post will also receive a 1-month banner ad to that article, which will appear on every page (except the homepage). See the Banner Advertising section below for details. If your company or service goes out of business before the sponsored period is complete, INeedCoffee reserves the right to remove the post or any dead links in the article. INeedCoffee will use the nofollow attribute on links to the sponsor website per Google’s TOS. This is an industry standard. The post will be clearly marked as a Sponsored Post for our readers. 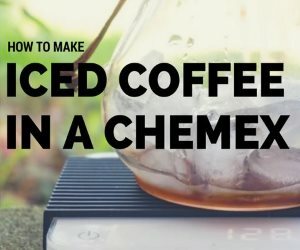 The article Make Cold Brew Coffee Quickly with the Gourmia Automatic Cold Brewer is an example of a Sponsored Post written by INeedCoffee. We worked directly with Gourmia on requirements and published after two revisions. In addition to sponsored posts, INeedCoffee also offers right-column banner advertising. Your ad would be displayed on every page except the home page. The home page averages between 2% and 2.5% of total traffic, so total ad impressions would be between 97.5% and 98% of total page views. We have code that detects and bypasses Ad-Blockers, so your banner will be delivered to all site readers. Ads will appear in the right sidebar. Sidebar banners should be 300 pixels wide and 250 pixels tall. We accept JPG, PNG or GIF format. You can start the ad anytime. If you are interested in a different sized ad, we can work something out. In addition to the sidebar banner, we will introduce you to our INeedCoffee Twitter (5,600 followers) readers. If you are interested or have any questions contact Michael at [email protected]. We use PayPal to accept all payments. Disclose who you are representing when you email. All sponsors are vetted for quality and relevancy before being accepted. We do not accept sponsorships from resellers. All sponsored articles are marked as sponsored to our readers.